The Olentangy Liberty girls basketball team overcame a 10-0 start and an 11-point first quarter deficit to upset Eastmoor Academy 55-51 in overtime Wednesday night at New Albany High School. Kelly Levering knocked down a pair of free throws with 2:57 left in overtime to give the 23rd-seeded Patriots the lead for good, sending them back to the district title game for the second time in four years. Emma Humenay knocked down six three-pointers on her way to a game-high 20 points to lead the Patriots (14-11), who have been the lower seed in each of their three tournament games. 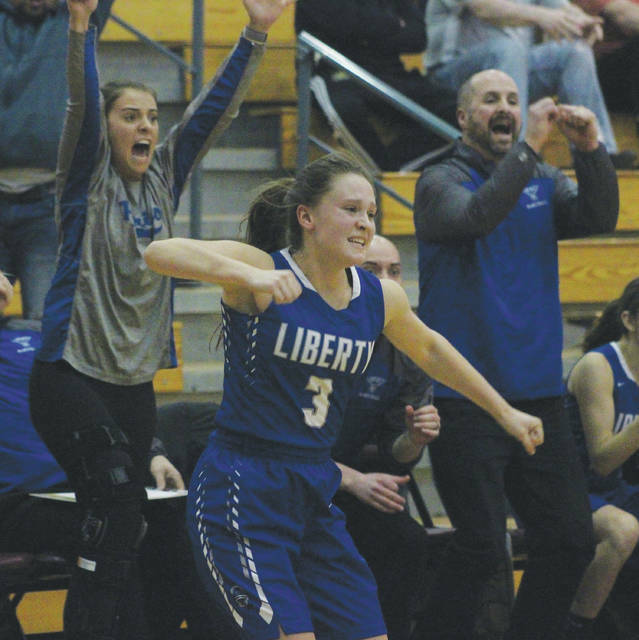 On top of being the underdog, Liberty was playing without two of its top players in Teegan Pifher (lost for the season in the third game of the year) and Kennedy Kashmiry (lost for the season in the first round of the tournament). Levering scored all of her nine points after halftime and Sydney Englehart scored seven of her nine in the first half to keep the Patriots in the game after their slow start. Eastmoor used a 6-0 run midway through the fourth quarter to build a seven-point lead. Baskets by Humenay and Jessie Barna set up Humenay’s game-tying three-pointer with 42 seconds left in regulation. She came off a double-screen, caught a Levering feed on the left side and let it fly. “Kennedy told me in the timeout, ‘Don’t look at your shot – just catch and shoot.’ So, that’s what I did,” Humenay said. Levering inbounded a ball from the left sideline to Spicer for a layup with 0:15 left to give Liberty a 47-45 lead. But, Eastmoor’s Mchale Grant drove the lane and buried the tying basket with 5 seconds left to send the game to overtime. Eastmoor scored the first 10 points to start the game and knocked down three three-pointers in the first quarter alone. “That was my biggest fear,” Krafty said. “I knew we could play with them. So, we spent two days just trying to convince the kids that (they) could come out and play with them. But, Liberty was able to keep it close in the first half. Englehart converted a three-point play to cut the deficit to five. But, Kari Gullick’s three in the final seconds gave Eastmoor a 24-16 lead at the break. “I told the kids at the half that if we take away the first 10 minutes of giving them the lead, we won the first half,” Krafty said. “That gave us a lot of confidence that we’ll be fine … and that’s definitely the mentality that we had in the second half. Back-to-back threes by Levering and Humenay capped a 15-4 second half start to give Liberty its first lead at 31-28 with 3:16 left. Eastmoor responded with a Grant basket and a Hailey Jordan put-back with 2:25 left to take the lead again and didn’t relinquish it until the final seconds of the fourth. Jordan had 12 points, Grant added 10 and Allayah Hughes chipped in eight points to lead Eastmoor (16-7). Liberty takes on third-seeded Pickerington Central in the district final Saturday at 1 p.m. at Ohio Dominican University’s Alumni Hall. Katie Cochran poured in a game-high 19 points, but it wasn’t nearly enough as the fourth-seeded Raiders rolled past the 14th-seeded Golden Eagles in a Division I district semifinal Wednesday night in Westerville. Big Walnut (17-7) fell behind early and never quite recovered. Reynoldsburg (20-5), which will play ninth-seeded Gahanna Lincoln in Saturday’s district final, led 23-10 after the first quarter. The Eagles played better in the second quarter, but were outscored 14-12 and couldn’t slice into the lead. The Raiders won the third 22-9 to all but seal the deal. Erin Boehm backed Cochran with seven points while Avery Schone finished with six in the setback. Uju Ezeudu led Reynoldsburg with 18 points while Mackenzie Davis added 16 and Kyria Walker chipped in 14.